Shri.V.J. Kurian IAS, who through his determination, commitment and visionary leadership has brought about people’s participatory developmental projects in Kerala has been promoted as the Additional Chief Secretary to Govt. of Kerala. He is presently the Principal Secretary in Water Resources, The Managing Director of CIAL and Director in Kochi Metro Rail Limited. 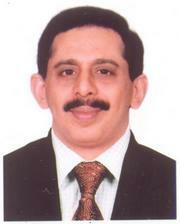 Born of Adv.Joseph Vattavayalil and Elizabeth at Pala Edamattom, Kurian is an IAS officer of the 1983 cadre. He started his official career as the Sub Collector of Muvattupuzha. He was appointed MD of the State Run Pharma company “Oushadhi”, where he demonstrated his developmental abilities by building a modern production facility with state of the art equipments and Oushadhi became a profit making public sector unit. He was appointed as the District Collector of Alleppy in 1990 and immediately he started his stint with people’s participation and he undertook and built a public park with the participation of people within 6 months. Within few months he was appointed as Collector of the Commercial Capital of Kerala “Ernakulam” where he took up the desire of the NRIs, tourists, Trade, Commerce and Industrial fraternity and tried his level best for development of the Naval airport. When the Naval airport development fell through due to many reasons, he projected development of an airport with people’s (more especially the beneficiaries viz., NRIs, business houses etc.) participation through donations and interest free schemes as a golden jubilee memorial of independence. As visionary idea was accepted very late, KIAS was formed in 1993 and CIAL in 1994. Despite many oppositions, obstacles legal and financial constraints, India’s first Public Private Partnership airport and 1st airport in private sector (outside AAI) was dedicated to the nation on 25th May 1999 exemplifying his never say die attitude and decisive leadership coupled with determination and hard work. As “CIAL Model” is being chosen in Aviation industry and Kerala infrastructure ventures, he is all in smiles and is a proud man. As the 1st Managing Director of Roads and Bridges Corporation (RBDC), he obtained the approval for 65 rail overbridges / fly overs from the Railways. He took up the most challenging overbridges in 23 locations and completed 13 of them in his term. The Seaport Airport Road owes its construction and completion to the Leadership of V J Kurian. The overbridges at Thripunithura, Irumpanam, Kalamaseery and Pullepady in Ernakulam District and Vengali, Vengalam, nandi, Chengotkavu, Muzhappilangad over bridges in the Calicut Kannur National Highway stand tall to his credit. In 2003 he was appointed MD of CIAL for the 2nd term and immediately, he reworked the term loan plans through which he was able to turn CIAL into profits and declared the dividend in the 5th year of Airport Operation. He also envisioned the CIAL Aerotropolis concept with Golf Course, Maintenance Hanger Facility, Trade Fair Centre, Centre for Perishable Cargo etc. which have come into existence and have added value to the airport, provided support to the industry and are operated profitably. He became Spices Board chairman (under Central Deputation) in 2006 where he set out to complete many Spice Parks in various state (Spice Park in Nedumkaddam, Idukki is a good example) and also Research Centres & Laboratories for ensuring Quality of Spices (State of the art testing lab in Ernakulam). He also made the computerized e-trade to enable more returns directly to the farmers. He was also the Chairman of the International Pepper Community (IPC) for 2009-10. He came back to CIAL for the third term in 2011 as MD, although he was also the Principal Secretary (Water Resources) to Govt. of Kerala. His immediate task was to settle the legal battle with HUDCO which had dragged over for past 7 years and his efforts brought a lasting and amicable solution to the issue acceptable to HUDCO and CIAL shareholders (along with Govt. of Kerala). He also started CIAL infrastructure Ltd., for CIAL’s diversification and the Solar Power Generation has already seen its effects. Wider power generation plans are also underway. Under his leadership CIAL airport consultancy saw fruit with Feasibility Report for Kannur International Airport, Consultancy for Bakel Project etc. The four-laning of the Airport road (from Athani to the Airport) is in full swing. The 700 cr. State of the art international terminal is now his dream project and the engineering works is in progress. Many consultations have been made with Airlines, travelling public etc. The project will take off soon. Apart from being a bureaucrat, he has his interest in farming and is an avid farmer. He also has a humane face to the development wherein he has ensured that maximum benefit has been given to those affected and his rehabilitation package (recognized by the World Bank) has been adopted in the projects that came thereafter. Smt.Mariamma, daughter of late Dr.Paul Alapatt – Mrs.Rani Paul, is his wife and he has two children Elder Dr.Joseph Kurian and his daughter (+2 student) Elizabeth Kurian. Retd. DGP of Kerala, Shri.Joseph Thomas (of International Stadium fame) is his brother.